Path between houses, in the early morning, just after dawn. Earlier pictures of a paths through modern housing are here: 1 2 3 . Each will open in a separate window. The first image in the Outer Suburbs series, with context, is here: 1 . Subsequent images are here: 2 3 4 5 6 7 8 9 10 11 12 13 14 15 16 17 18 19 20 21 22 23 24 25 26 27 28 29 30 31 32 33 34 35 36 37 38 39 40 41 42 43 44 45 46 47 48 49 50 51 52 53 54 53a 55 . Each will open in a separate window. 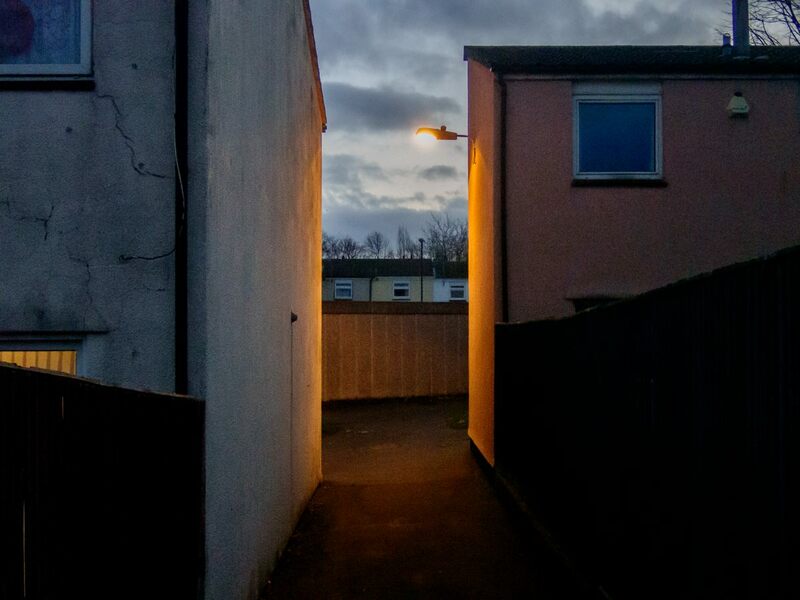 Technique: TG-5 at 43mm (equiv); 2500 ISO; Lightroom, using the Camera Natural film simulation; south Bristol; 12 Dec 2018. As you can tell from the date of this comment (! ), I’m behind on things. So glad I saved the e-mail about this photograph for later, though. It’s a beauty. The light and contrasting colors (I love the orange and blue) take it above the ordinary. Perhaps even more, I appreciate that this is not the sort of scene most people—and we know you are not “most people”—would think to notice. Love the light, the colours, and the atmosphere. Wonderful shot; love the mood..
Do you remember that song too?